1TAC 3-in-1 Utility Flashlight, Magnetic Base, 1200 Lumens With 20X Zoom, Lantern, Emergency SOS Safety Beacon, Strobe Mode Light. This Multi-functional flashlight with lantern and SOS beacon is great for any situation. With 5 modes: High, Med, Low, Lantern, SOS Beacon you can use it anywhere. It is ultra-bright (1200 Lumens) and made from aircraft grade aluminum making it extremely durable. 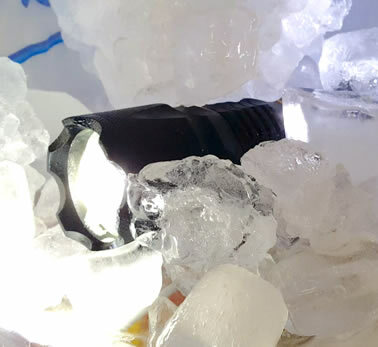 From daily use to emergency situations this flashlight will stand up to the challenge. There are times when you need a flashlight and there are times when you could really use a lantern and in the case of an emergency what you really need is a SOS beacon to keep you safe or signal for help. So why not get a light that can do all three? 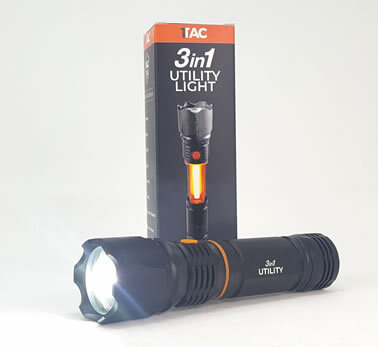 Introducing the new 3-in-1 Utility light from 1Tac. 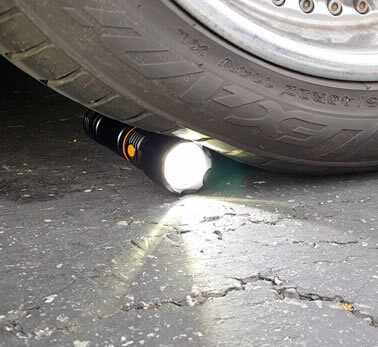 The most useful and versatile utility flashlight tool available on the market today. 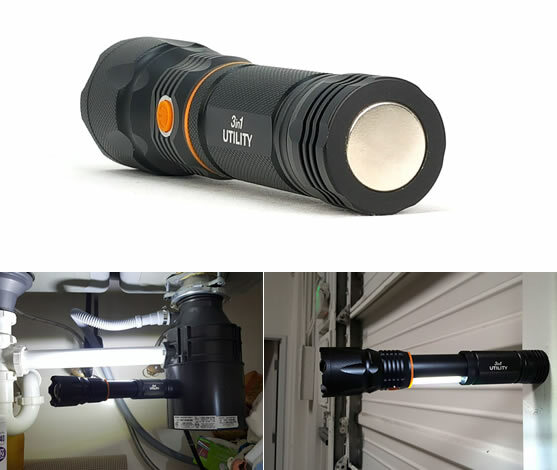 Now when you need a flashlight you get the toughest, brightest and best available, and when you need a lantern you simply slide it open to reveal the COB LED so bright it can fill an entire garage with light. If you’re caught in an emergency simply press the button and your lantern instantly turns into a flashing SOS safety beacon. Plus, the Utility Light comes with a magnetic base for hands free use. So you can use the flashlight features, the lantern or the emergency SOS feature and keep both hands-free. 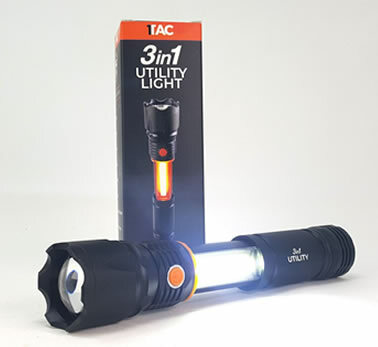 Ultra compact and ultra lightweight the 1TAC 3-in-1 Utility Flashlight is the most universal emergency tool on the market. The light offers CREE XM-L2 Hi LED emitters up to 1200 LUMENS with a lamp lifespan of 100,000 hours. It boasts a magnetic base for hands free use. 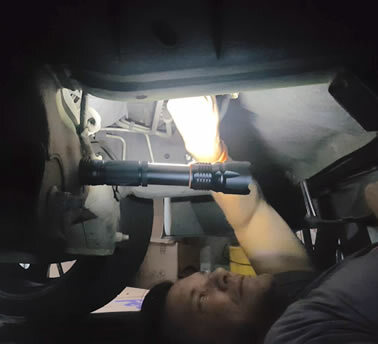 There are 5 Light modes including two flashlight modes a center light and two auxiliary side flashlight LEDs low, medium and high beam options. There is a COB white lantern mode and a COB red SOS strobe mode. It has up to 2000x zoom capability with a telescoping head. Weather and dust resistant. Digitally regulated output to maintain constant brightness. Reverse polarity protection to protect from improper battery installation. Over heat protection for your hands to avoid high temperature on outer case. Anti-roll, anti-slip resistant body design. A lightweight, ultra high-powered Magnetic Base is built into the rear base of the case and allows you to attach your light to most metal surfaces for easy hands free use. 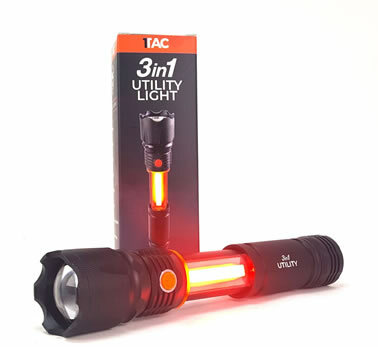 The 3-in-1 Utility Flashlight operates all the beam modes from one simple easy to use switch. From the on and off switch you can cycle through the various beam modes by pushing the button again and again until you get the desired beam. SUPER-BRIGHT: 1200-lumen (max) Cree LED sweeps bright light over the length of about two football fields (660 ft / 200 m) and reaches nearly 2000 ft. Fully zoomable from wide to narrow beam. Features 5 adaptable settings: High / Medium / Low / Lantern / Strobe-SOS. LONG-LASTING: Hours of powerful, non-diminishing brightness from the premium Lithium-Ion 18650 Button-top Cylindrical 3.7V 2200mAh Rechargeable Battery (Not Included). LEDs boast an extended 100,000-hour lifespan. TOUGH & RELIABLE: IP65-rated water and weather resistant and designed for use in heavy rain. Its durable aluminum body and shock-resistance endure rough handling. SMART DESIGN: A streamline chassis with an anti-slip finish holds fast in your hand or stands on-end as an emergency lamp or can attach to any metal for hands free use with the magnetic base.